PRC 51? RESOLVED on the MOTION of Councillor Jackie Greenow OAM seconded Councillor Marcus Cornish that apologies be received for Councillors Ben Goldfinch and Maurice Girotto. PRC 52? RESOLVED on the MOTION of Councillor Tricia Hitchen seconded Councillor Marcus Cornish that the minutes of the Policy Review Committee Meeting of 9 September 2013 be confirmed. Corporate Planning Coordinator, Tanya Jackson introduced the report and invited Stuart Reeve, Managing Director of Micromex Research to give a presentation.??????????????????????????????????????????????? PRC 53? RESOLVED on the MOTION of Councillor Jackie Greenow OAM seconded Councillor Karen McKeown that the information contained in the report on Community Survey 2013 be received. Councillor Prue Car returned to the meeting, the time being 8:04pm.????????????????????????????????????????? 1.???? 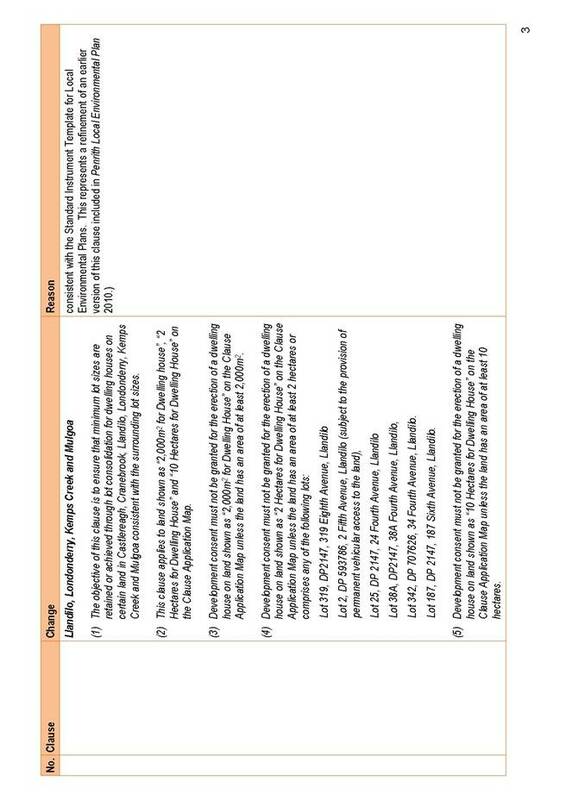 The information contained in the report on Penrith Business Alliance Limited (PBA) 2013-2014 Business Plan be received. 2.???? Council agree to the Penrith Business Alliance Business Plan for 2013-2014 and provision of the amount of $516,000 (plus GST) to be paid in two separate instalments of $258,000 (plus GST) each, in October 2013 and March 2014, in accordance with the provisions of the Deed of Agreement. 3.???? Council defer consideration of the Penrith Business Alliance?s request for an advance of $200,000 from the 2014-15 budget to cover operational expenses from July to October 2014 until early in the 2014 calendar year to coincide with negotiations on the new deed of agreement with the Penrith Business Alliance for its continued operation. 4.???? 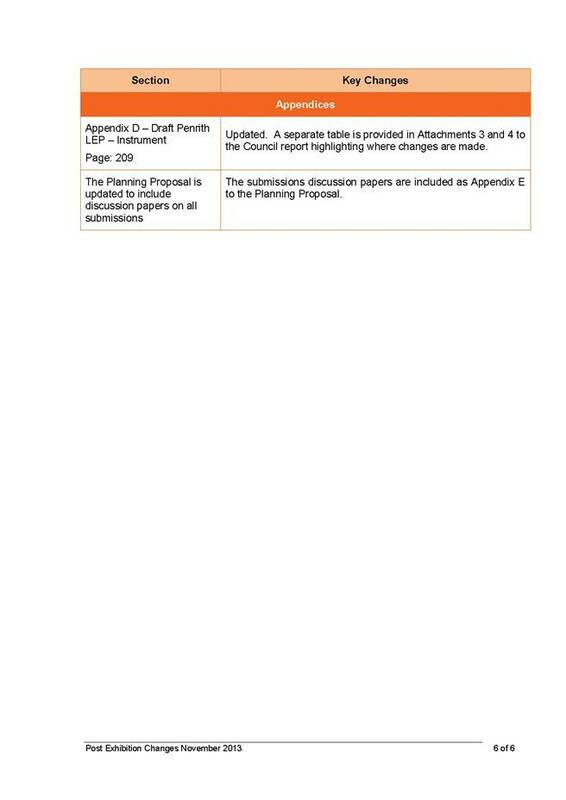 A separate report be submitted to Council?s Ordinary Meeting of 25 November 2013 tabling the Penrith Business Alliance?s Financial Plan once the draft Financial Plan has been considered by the Penrith Business Alliance Board. 5. ??? A letter be sent to the Chairperson of the Penrith Business Alliance, expressing Council?s appreciation to the Board for their work over the past year. Councillor Bernard Bratusa returned to the meeting, the time being 8:53pm.????????????????????????????? 1.???? 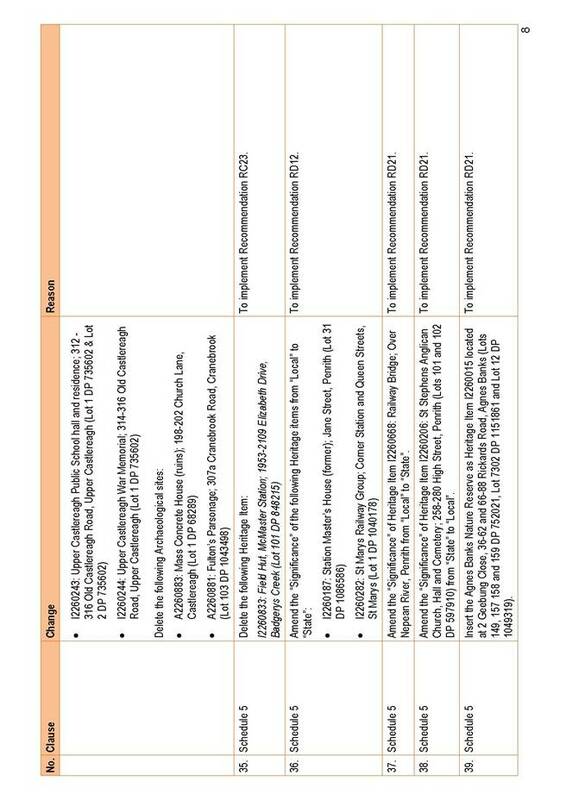 The information contained in the report on Neighbourhood Renewal Program? - North St Marys and Werrington Neighbourhood Action Plans be received. 2.???? 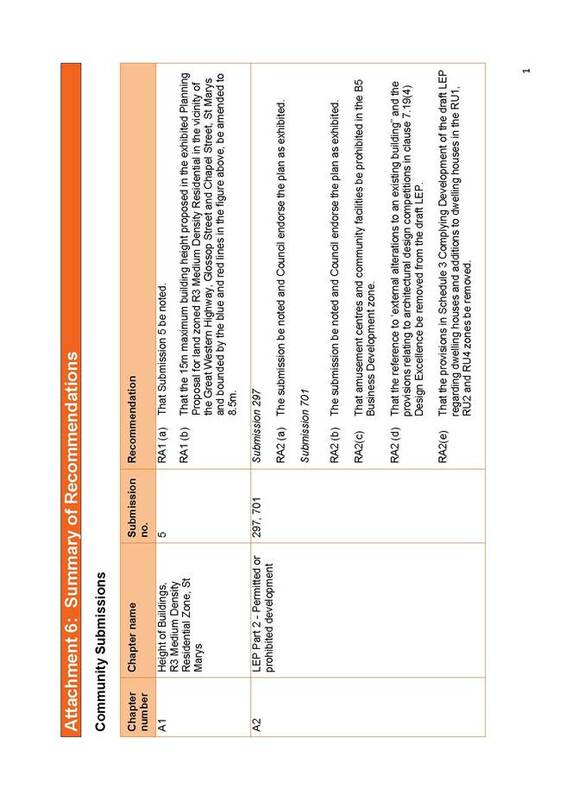 Council endorse the North St Marys Neighbourhood Action Plan 2013 and the Werrington Neighbourhood Action Plan 2013 as provided in Appendix 2 and 3 of this report. Councillors Michelle Tormey and Tricia Hitchen left the meeting, the time being 9:06pm and did not return.???????????????????????????????????????????????????????????????????????????????????????????????????????????????????????????????????????????? 1.??? The information contained in the report on Engineering Construction Specification for Civil Works (Working Draft) be received. 2.??? Council endorse the Engineering Construction Specification for Civil Works (Working Draft) for the purpose of exhibition and consultation with the industry. 3.??? Council endorse minor amendments to be made to Council?s Engineering Guidelines for Subdivision and Other Development - Part 1: Design to ensure consistency between the two documents. 4.??? 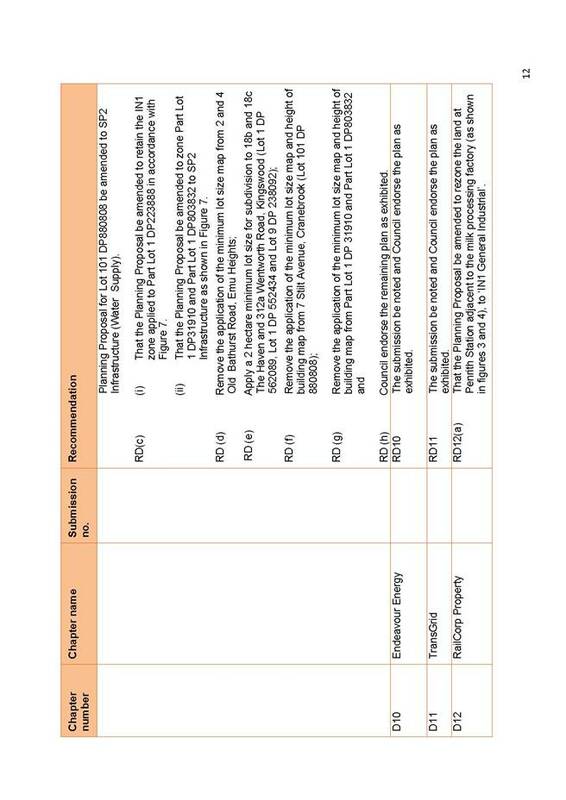 The Engineering Construction Specification for Civil Works (Working Draft) be applied to civil works associated with Development Applications lodged after Council?s endorsement of the document. 5.??? At the conclusion of the exhibition a report be presented to Council for adoption of the final document. 6.??? References to the Engineering Construction Specification for Civil Works (Working Draft) be updated in the next version of Council?s Development Control Plan. 7.??? The final specification be reviewed by Engineering Services and City Works periodically with only substantial amendments to be reported to Council. 3??????? Stormwater Drainage for Building Developments (Working Draft)???????????????????????????? 1.???? 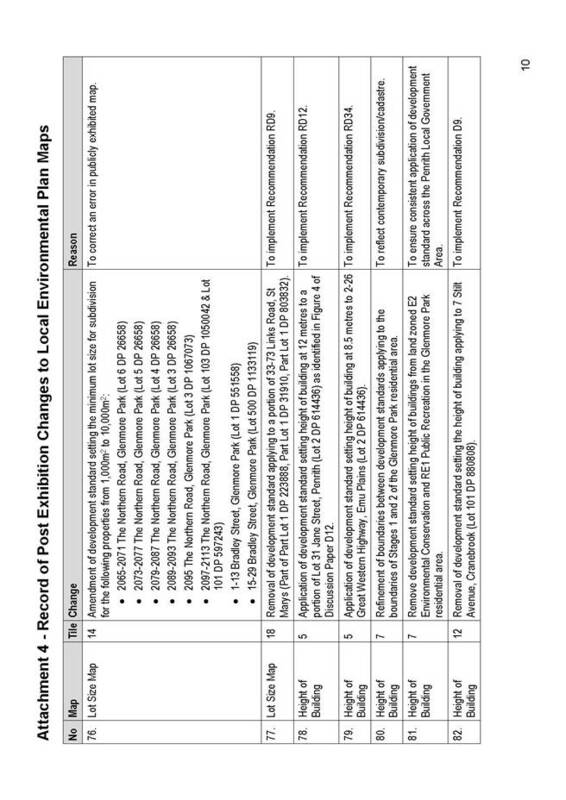 The information contained in the report on Stormwater Drainage for Building Developments (Working Draft) be received. 2.???? Council endorse the Stormwater Drainage for Building Development (Working Draft) for the purpose of exhibition and consultation with the industry. 3.???? 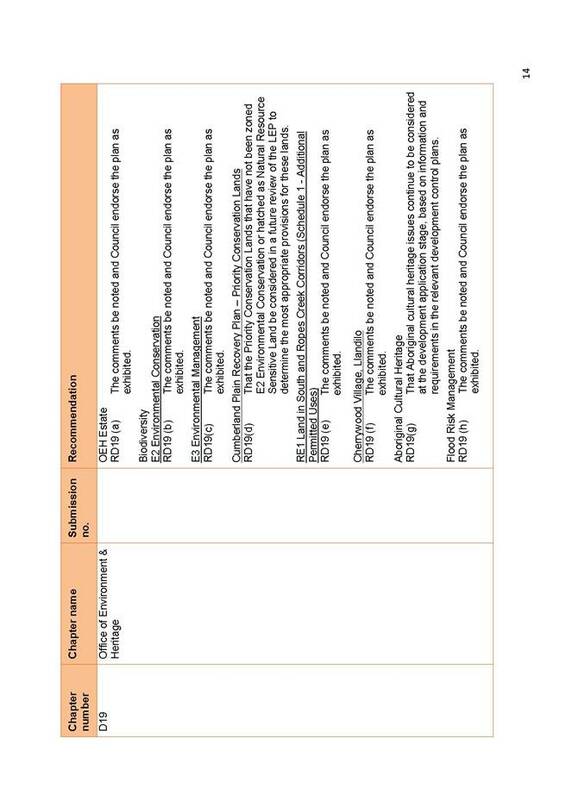 The Stormwater Drainage for Building Developments (Working Draft) be applied to civil works associated with Development Applications lodge after Council?s endorsement of the document.? 4.???? 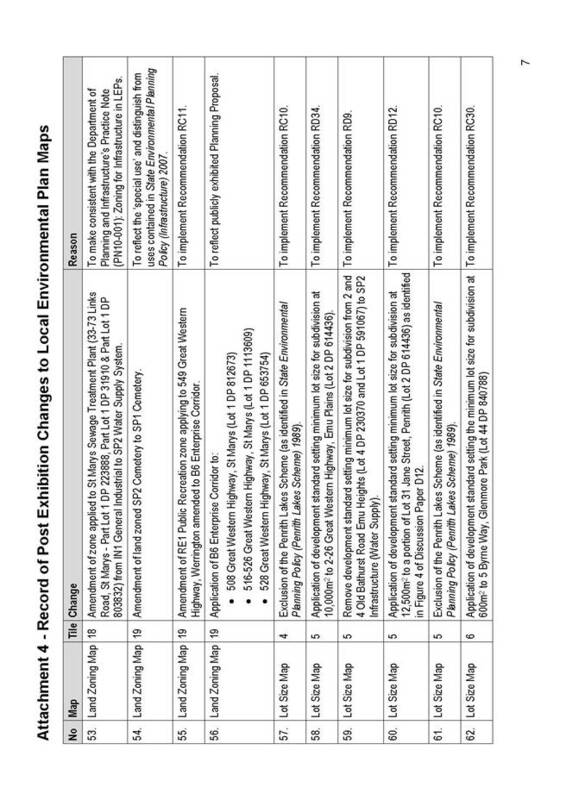 References and information in Penrith Development Control Plans 2006 & 2010 and Council?s Guidelines for Engineering Works for Subdivisions and Developments Part 1: Design be updated to be consistent with the adoption of Stormwater Drainage for Building Development (Working Draft). 5.???? At the conclusion of the exhibition a report be presented to Council for adoption of the final document. 5??????? Draft Policy on the Payment of Expenses and Provision of Facilities to Mayor, Deputy Mayor and Councillors????????????????????????????????????????????????????????????????????????????????????????????????????? 1.???? The information contained in the report on Draft Policy on the Payment of Expenses and Provision of Facilities to Mayor, Deputy Mayor and Councillors be received. 2.???? Council advertise for 28 days a public notice of its intention to adopt the amended Policy on the Payment of Expenses and Provision of Facilities to Mayor, Deputy Mayor and Councillors. 3.???? A further report be presented to Council at the conclusion of the exhibition period. 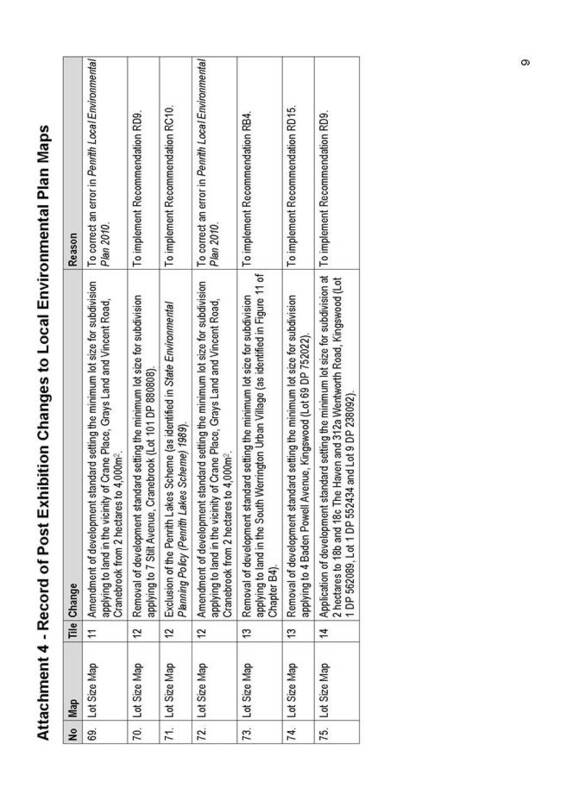 Planning Proposal for Penrith Local Environmental Plan - Outcomes of Public Exhibition? ?? 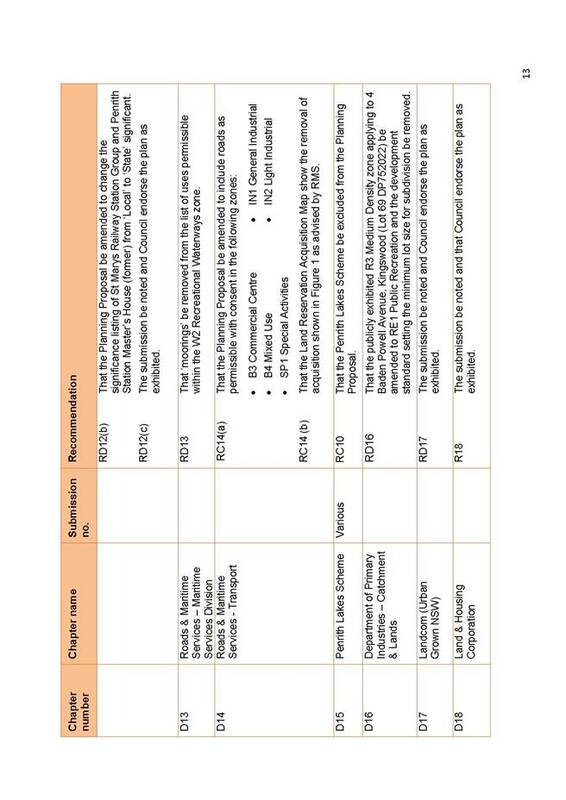 The Planning Proposal is, in most cases, based on a direct translation of the existing planning controls (land use zones, building height, FSR etc) into the State Government?s Standard Instrument, especially for the established residential areas and local/neighbourhood centres which are not identified for growth in the next 5 years. The Planning Proposal also includes a number of site-specific ?rezoning? proposals, ?deferred? 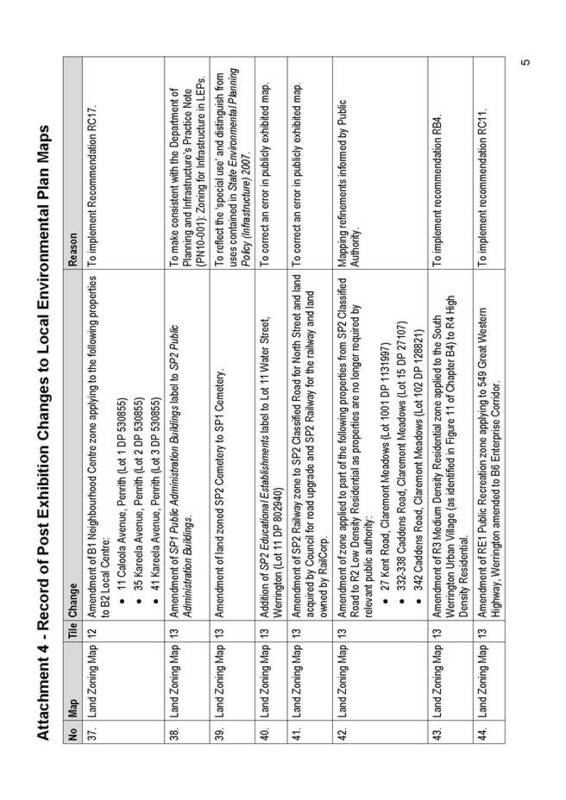 matters from the Penrith LEP 2010 (Stage 1) and growth areas identified in the draft Urban Strategy where a change in zone is proposed. It also includes a number of adopted or gazetted LEPs. During this public exhibition period, a total of 4,630 enquiries were received resulting in a total of 819 submissions.? There were 766 submissions received from the community and 53 submissions received from 34 public authorities. Out of the submissions received two key issues have been raised by the local community. ???????? The proposed zoning of the Glossop Street Precinct at St Marys (569 submissions).? 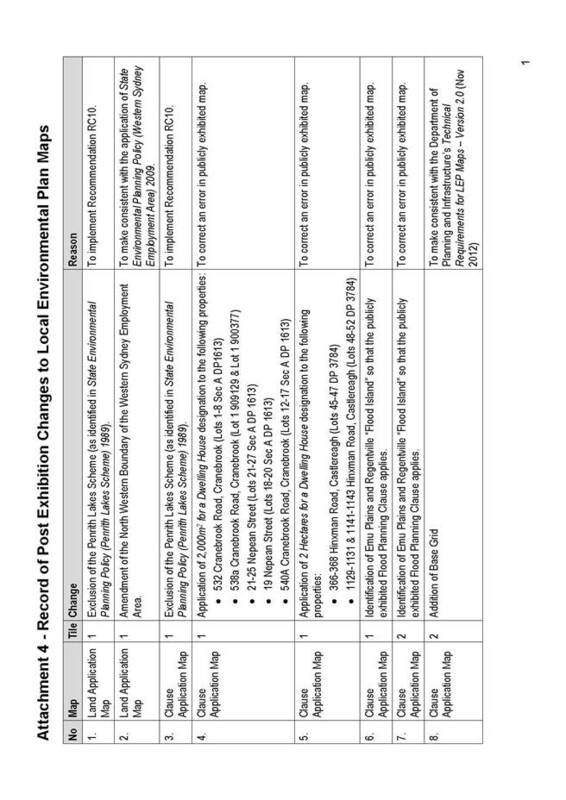 The Stage 2 Planning Proposal also includes a number of site-specific ?rezoning? proposals, ?deferred? 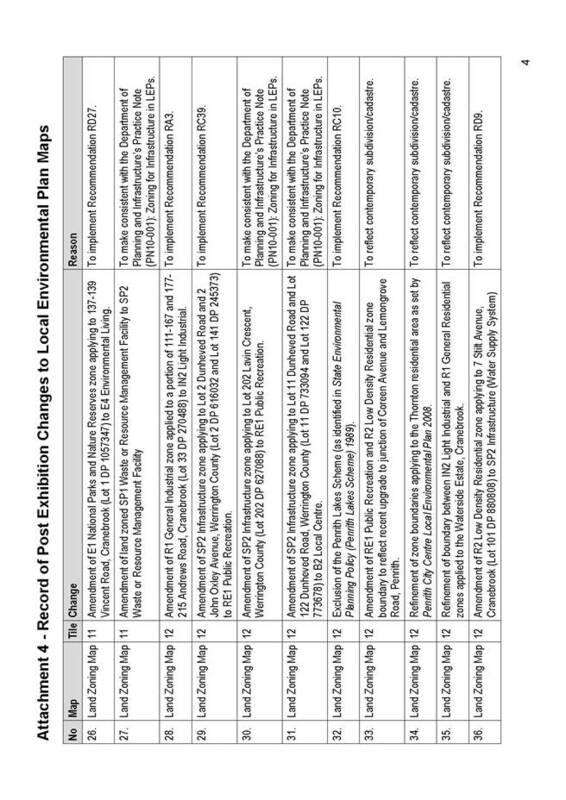 matters from Penrith LEP 2010 and growth areas identified in the draft Urban Strategy where a change in zone is proposed. 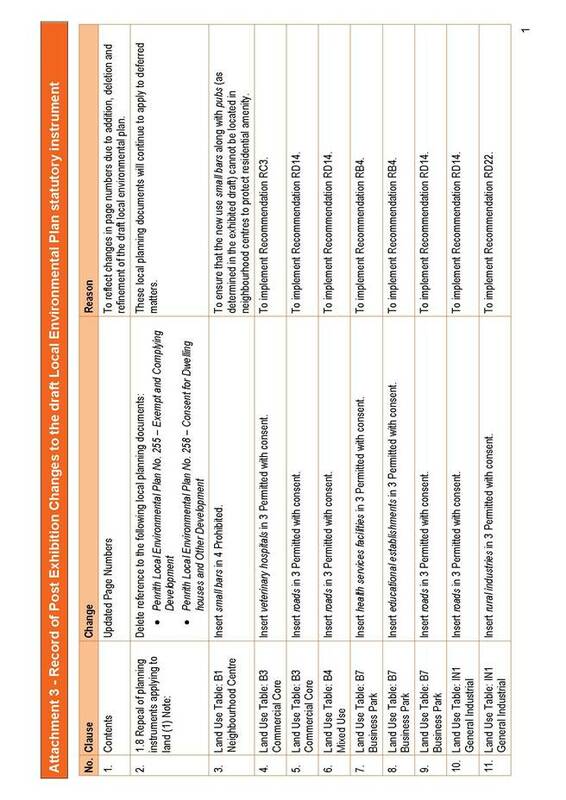 Further, the Planning Proposal includes a number of recently adopted or gazetted LEPs.? 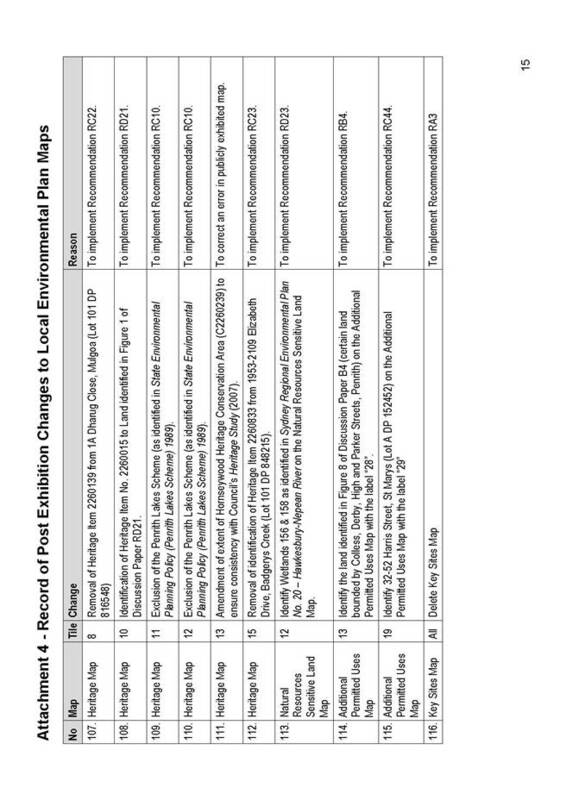 These include the release area LEPs (Glenmore Park Stage 2, South Werrington Urban Village and Caddens), Penrith City Centre LEP 2008, Penrith LEP 2010 and Penrith LEP 1991 (Environmental Heritage Conservation). 6.?? 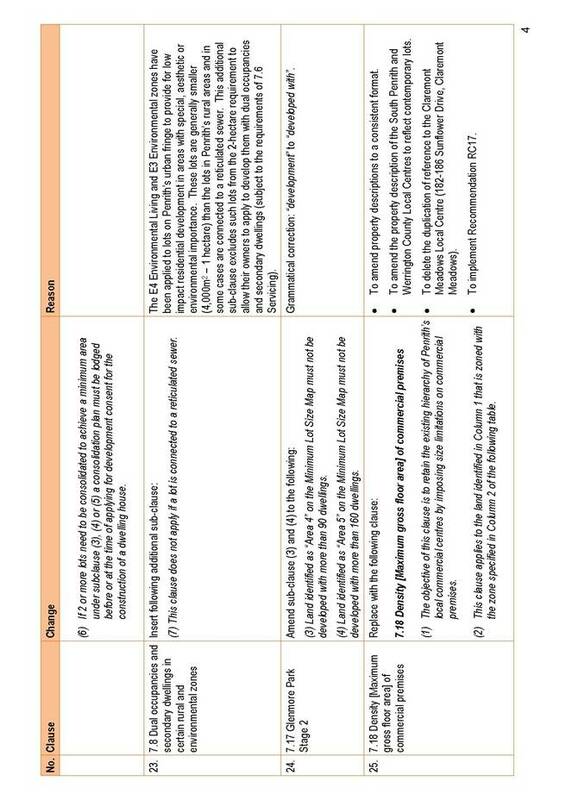 Information and fact sheets on understanding the LEP, zones, how to have a say, etc. 9.?? Availability of staff at Penrith and St Marys to answer community enquiries. Part B ? ???? Submissions received that relate to a Key Precincts e.g. ?Penrith Health and Education Precinct? Part D ? ???? 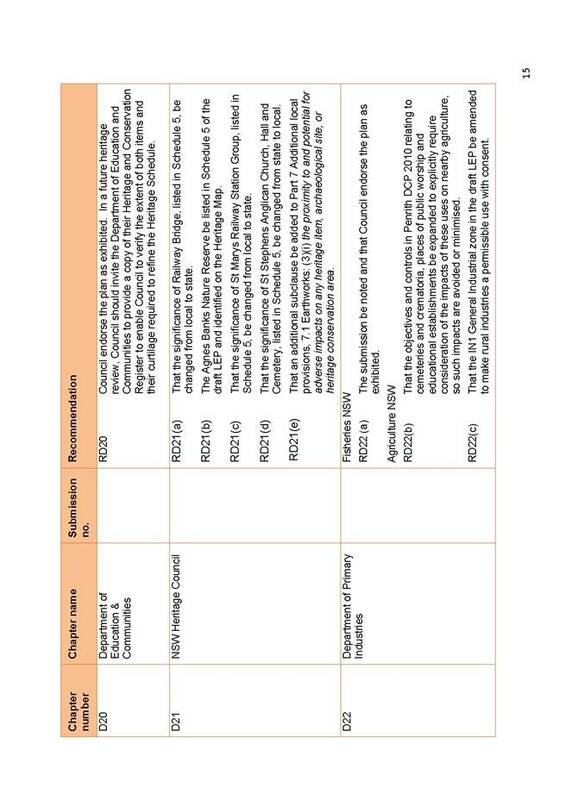 Submissions received from public authorities that are not associated with parts A to C above. 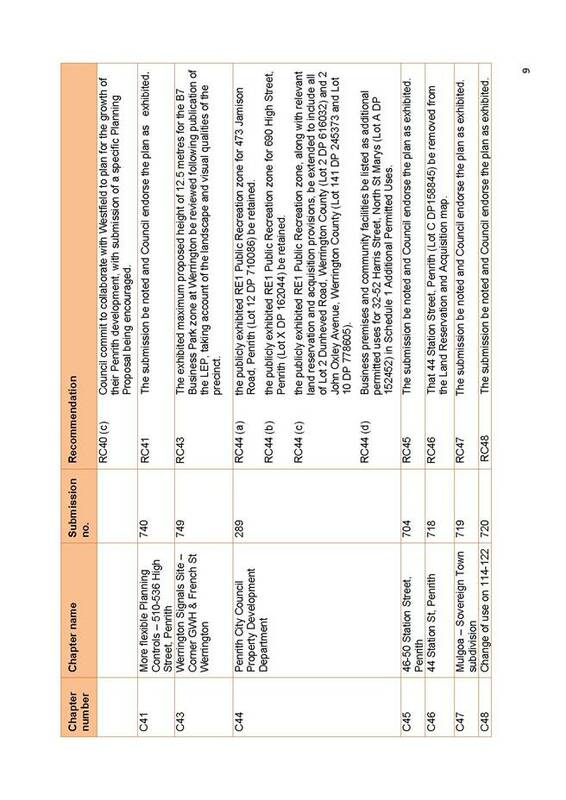 The submissions received during the exhibition period for the Planning Proposal are summarised in the Table 2 below.? One of the dominant issues was the proposed zoning of land within the E4 Rural Lands in Castlereagh and Cranebrook with the majority of representations in favour of the proposed zoning.? On 25 June, a meeting was held with a group of affected owners, predominantly residents from Hinxman and Sheredan Road at their request. The other dominant issue is the Glossop Street Precinct at St Marys where a higher density residential zone has been applied in accordance with the draft Urban Strategy.? A pro-forma letter has been circulated objecting to the higher density zone which resulted in a large number of submissions being received by Council.? 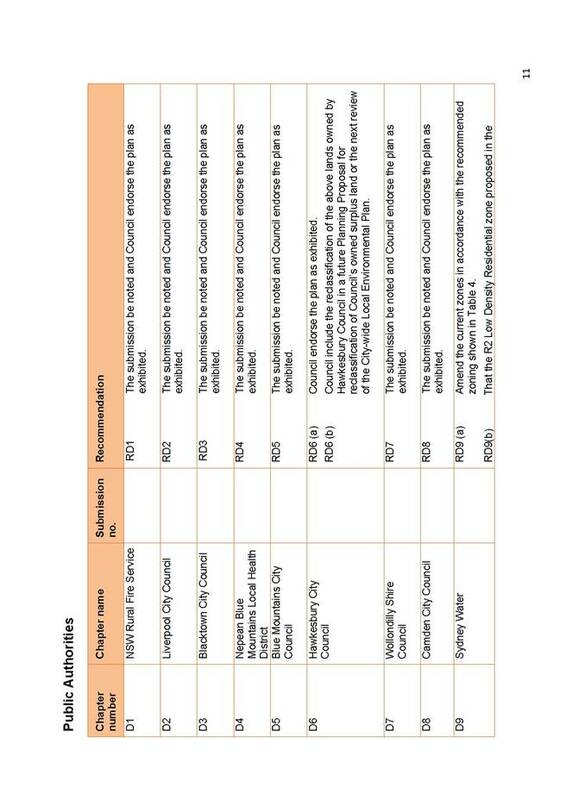 A summary of both these matters is provided below with further detailed commentary provided in Attachment 5 (provided separately to Councillors and available on Council?s website).? 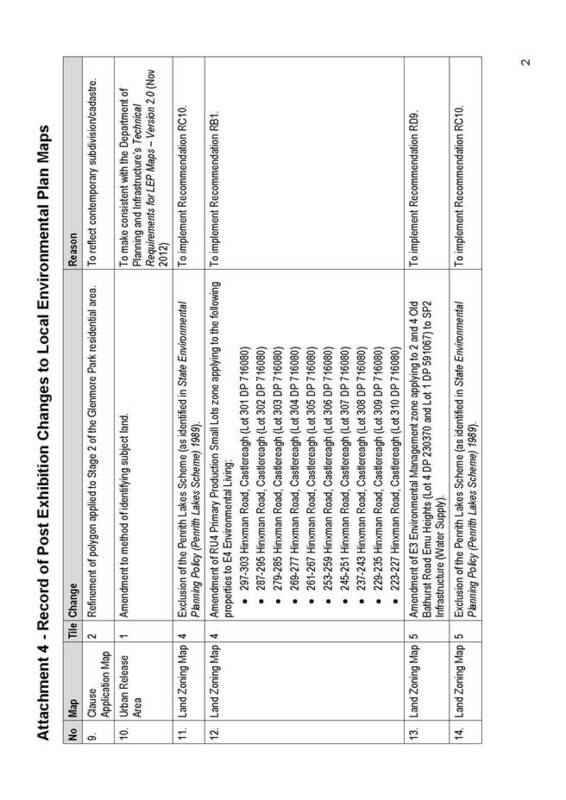 When Stage 1 of the City-wide Local Environmental Plan (LEP) was exhibited in 2008-09, it proposed to zone certain land in Castlereagh and Cranebrook as E4 Environmental Living.? 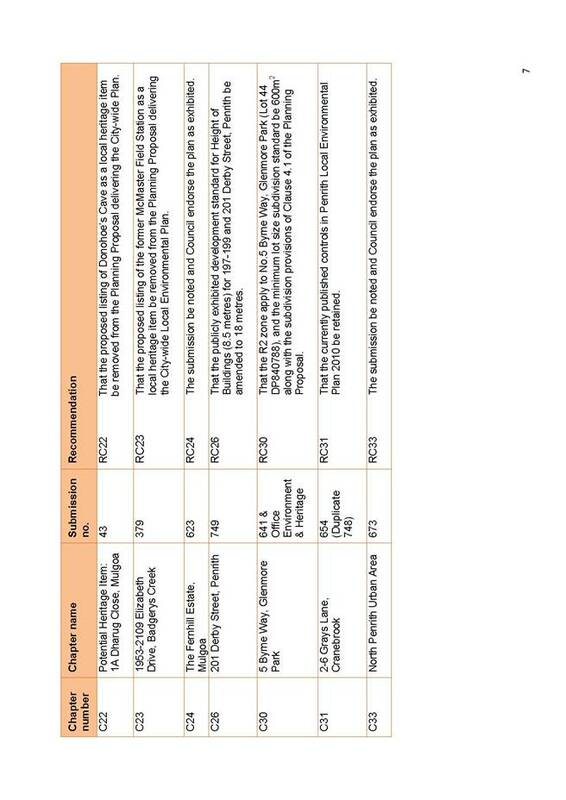 The E4 zone was selected to implement the outcomes of Council?s adopted Rural Lands Strategy (2003).? The land, however, was deferred from Stage 1 of the LEP, in response to community submissions received, including a petition from local residents.? 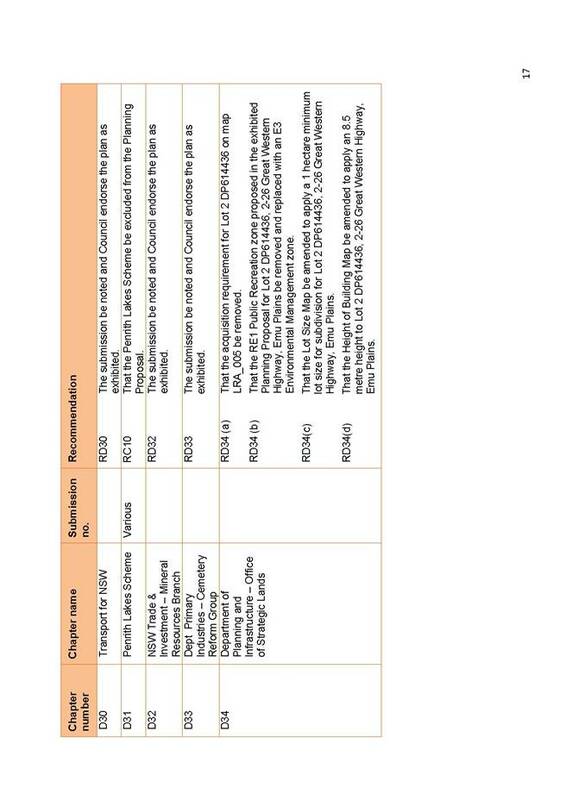 Most submissions objected to the proposed E4 zone predominantly because it would have prohibited new commercial agriculture and animal boarding or training establishments.? There were also concerns about the title of the zone and its potential or perceived implications.? Other submissions supported the proposed E4 zone, largely because it would have helped to enhance aspects of rural living. As part of the Stage 2 Planning Proposal, an alternative zoning option was placed on exhibition.? This took into account the views expressed in the earlier exhibition, the physical characteristics of the area and the results of a 2009 land use survey.? 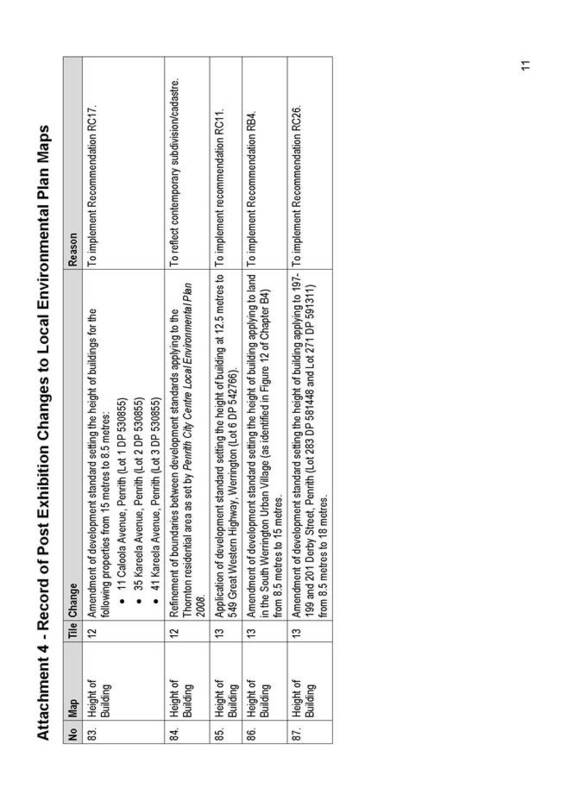 The alternative zoning option proposed to zone part of the area as RU4 Primary Production Small Lots and the other part as E4 Environmental Living. The Stage 2 Planning Proposal exhibition has resulted in 114 community submissions and six petitions containing a total of 146 signatures.? Of the 114 submissions, 78 (68%) support the zone proposed on their own property; while 35 (31%) object to the zone proposed on their property.? In addition to expressing a view about the zoning of their property, many submissions (85) also express a view about the zones proposed in their locality.? Of the 85 submissions, all object to the zone proposed in their locality, even those that support the zone proposed on their own property.? This indicates a need to reconsider the location of the boundary between the proposed E4 and RU4 zones.?? The objections generally centred on three localities ? Hinxman Road, Keech Road/Sheredan Road and Church Lane/Vane Street. 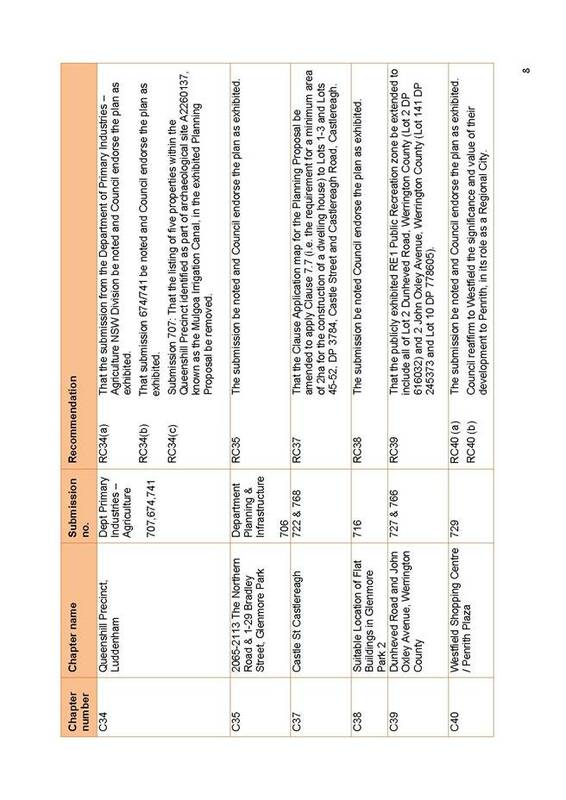 The reasons for objecting to the RU4 zone (and supporting the E4 zone) relate to the impact on the character of the area; existing covenants applying to properties in the Castlecrest Estate; the impacts of uses permitted in the RU4 zone; the agricultural capability of the land; and the impact on property values.? The reasons for objecting to the E4 zone (and supporting the RU4 zone) relate to the E4 zone not being a true translation of the current rural zones; the impact on the character of the area; the restrictions on land use and the loss of agricultural potential; and the impact on property values. In the Hinxman Road locality, it is considered that the zone boundary should be amended so properties in the Castlecrest Estate, subject to restrictive covenants, are zoned E4 consistent with the character of this area.? Properties in Hinxman Road, outside of Castlecrest Estate, are proposed to be zoned RU4 to support existing agricultural activities and opportunities for new agricultural activities. In the Keech Road/Sheredan Road locality, it is considered that there is insufficient justification for amending the zone boundary, given the character and uses in this locality and the mixed views expressed by local residents.? The zone boundary exhibited in the Planning Proposal corresponds with the boundary between the current 1(a) Rural ? General and 1(b) Rural ? Smallholdings zones under Penrith LEP No. 201 (Rural Lands). In the Church Lane/Vane Street locality, it is also considered that there is insufficient justification for amending the zone boundary, given existing uses in this locality.? 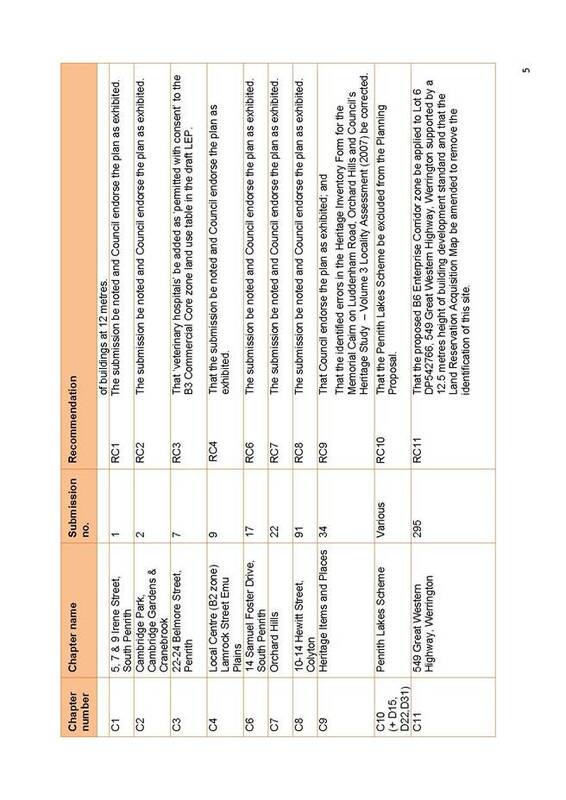 Council also received two public authority submissions relating to the Castlereagh and Cranebrook area.? 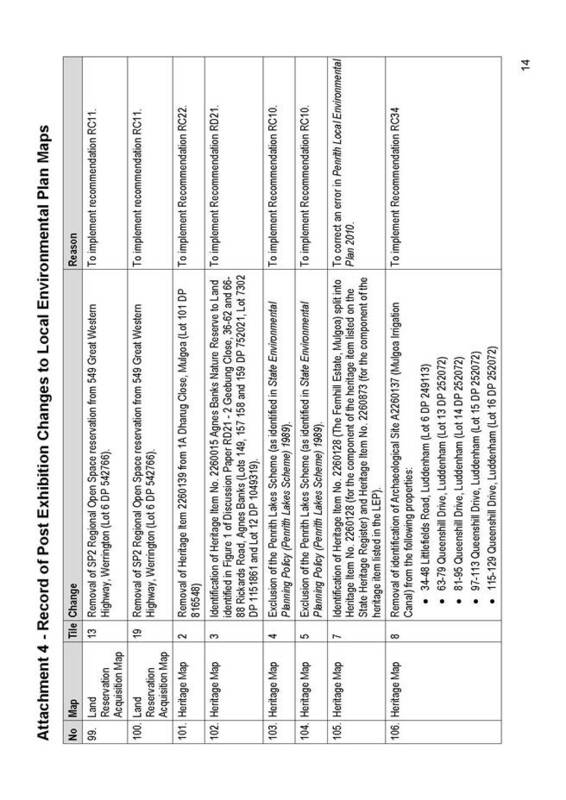 The Office of Environment and Heritage (OEH) recommends that, at least six lots, three identified as Priority Conservation Land and three as significant areas of vegetation, should be zoned E2 Environmental Conservation or hatched as Natural Resource Sensitive Land (NRSL).? 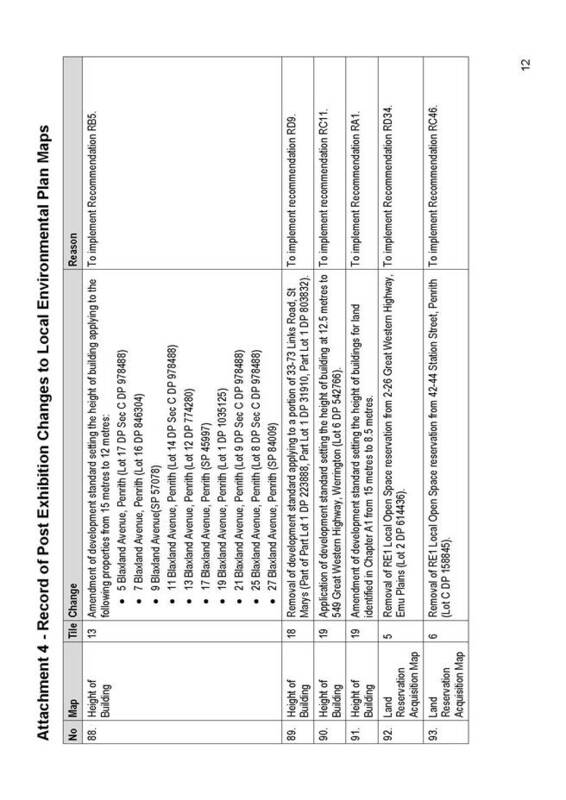 It is proposed that these lots be considered in a wider review of the area, which also includes the deferred E2 lands to the north, following the completion of Stage 2, given other options will not provide an opportunity for affected landowners to comment or will delay the LEP process. The Department of Primary Industries ? 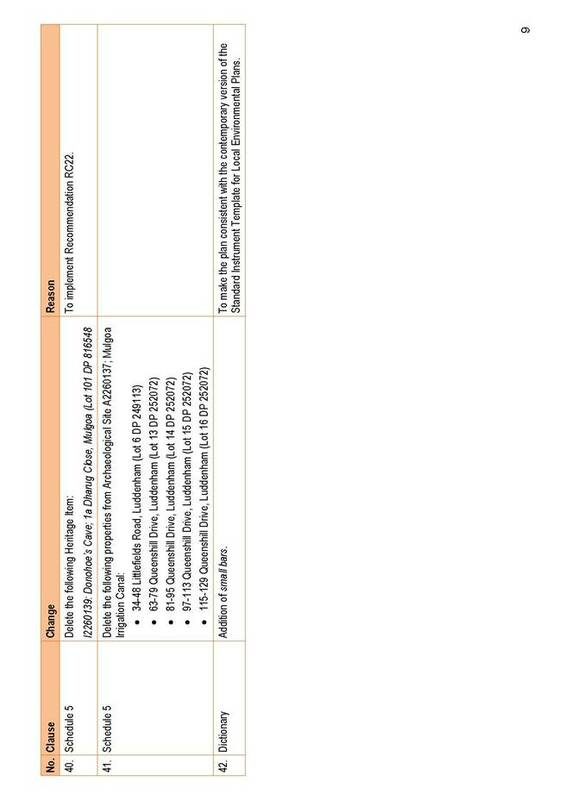 Agriculture NSW Division (DPI-Ag) recommends that land within agricultural land classes 2 - 4 and already cleared be zoned RU4.? This would mean that the entire area should be zoned RU4, except for parts of the Castlecrest Estate and the six lots identified by the OEH.? This option, however, would not reflect existing land uses in the area, with about 80% of properties currently being used for rural living despite agriculture being permitted.? 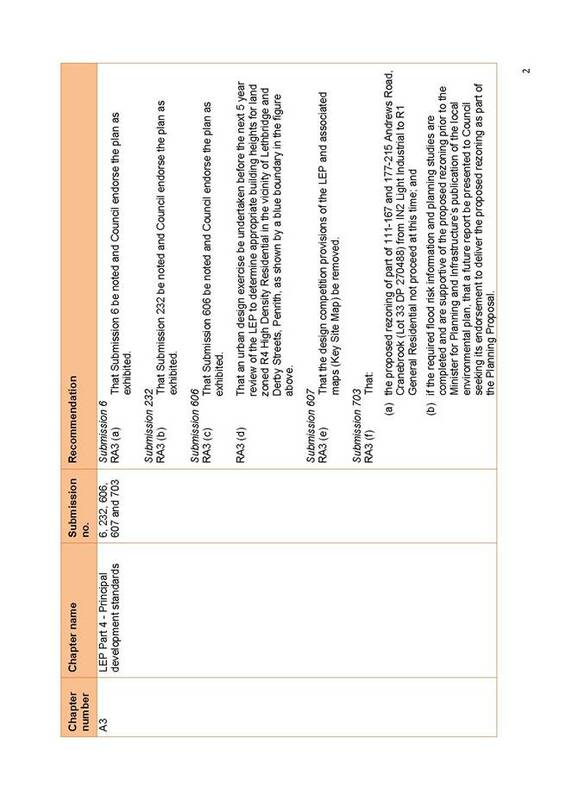 Overall, it is considered that the proposed amended zones shown in Figure 9 of Chapter B1 of the discussion paper (Attachment 5) achieve an appropriate balance between supporting new agricultural activities in those areas where they currently exist, and maintaining the character and amenity of rural living areas.? They also recognise the ecological and scenic values of the vegetation along the escarpment. 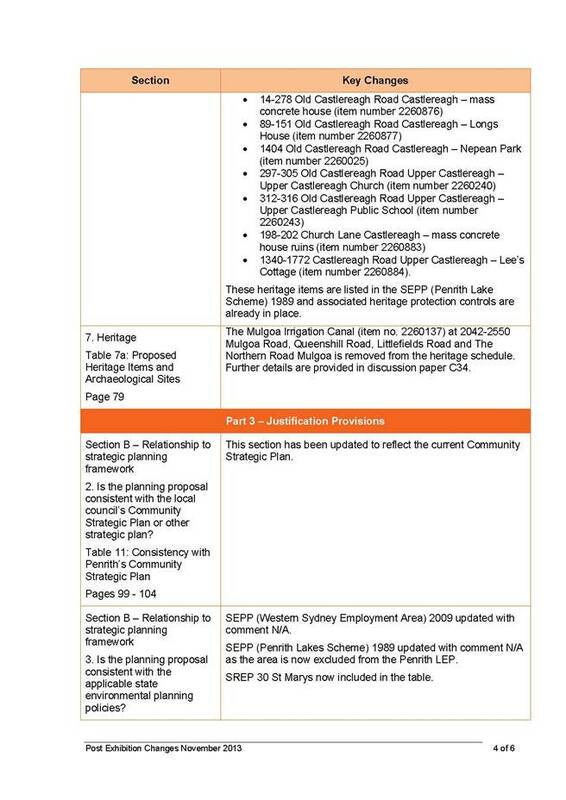 The draft Metropolitan Strategy for Sydney (the draft Metropolitan Strategy) and Subregional Strategy compels Council to adopt local policies that will result in an increase in housing and employment around transport accessible centres.? This requires support for ongoing housing growth through urban renewal in centres, including St Marys, which is located on the strategic transit network as identified in the draft Metropolitan Strategy.??? 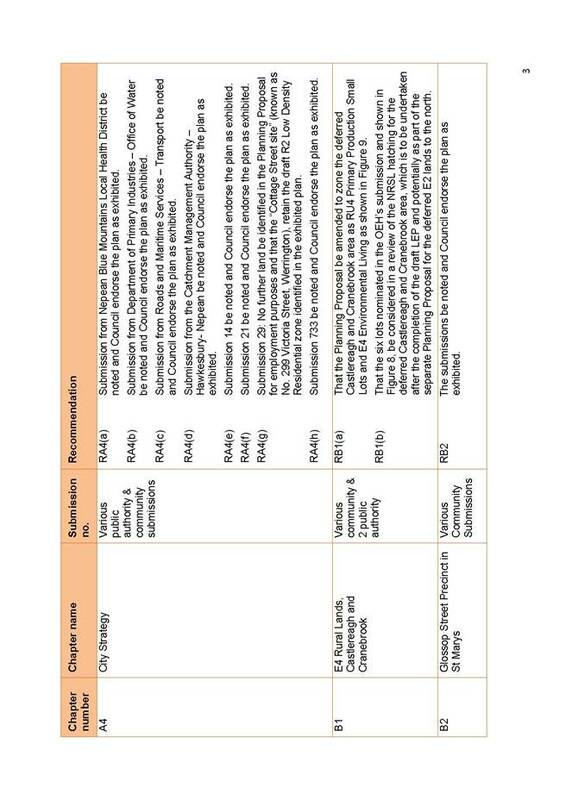 The planning controls included in draft amendment to LEP 2010 have evolved out of Council?s Urban Study and Strategy which was completed in 2008.? The Penrith Urban Study and Strategy provides a centres based planning approach seeking to ?ensure all future high density development in existing urban areas will be centre based development and located within 800 metres of a centre? with St Marys identified as one key town centre. 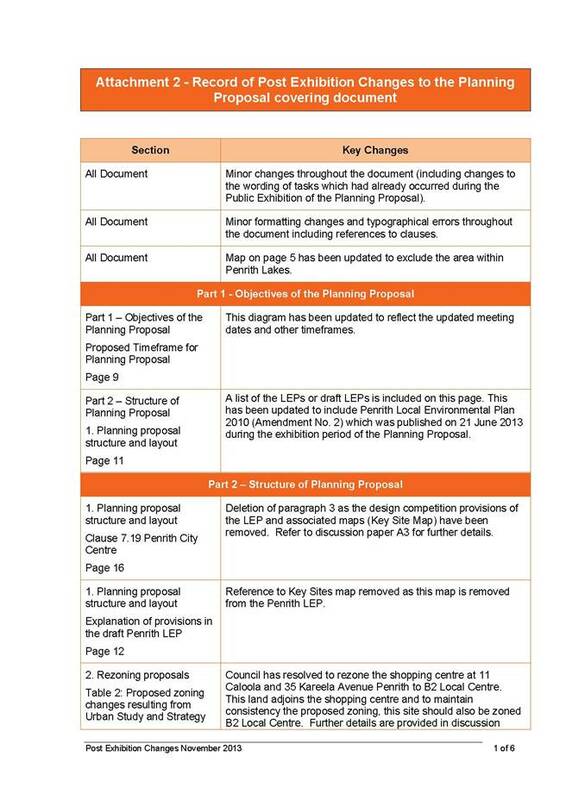 The proposed rezoning under the draft LEP aims to implement the overarching planning strategies and principles required by the draft Metropolitan Strategy, draft Subregional Strategy and Penrith Urban Strategy.? The rezoning provides an opportunity to renew older housing stock within the Glossop Street Precinct, incorporating more contemporary urban design and sustainability principles that reflect the policy directions of the guiding planning strategies. Housing delivery is critical for Penrith Council to meet the dwelling targets handed down to Council by the State Government through targets set in the draft Metropolitan Strategy.? The location of the Glossop Street Precinct is ideal given its proximity to public transport (trains and buses), employment provision (St Marys Town Centre, retail and industrial uses) good access to local services and schools to support higher density housing.??? The Glossop Street Precinct provides a sustainable location for increased housing density.? Providing increased density of housing in another location such as in urban release areas would not meet sustainable locational criteria of being close to existing infrastructure.? This imposes significant additional costs to government, Council and the community in the provision of new infrastructure which is not required to the same extent in established areas.? The Glossop Street Precinct has potential to deliver approximately 1,000 new dwellings.? 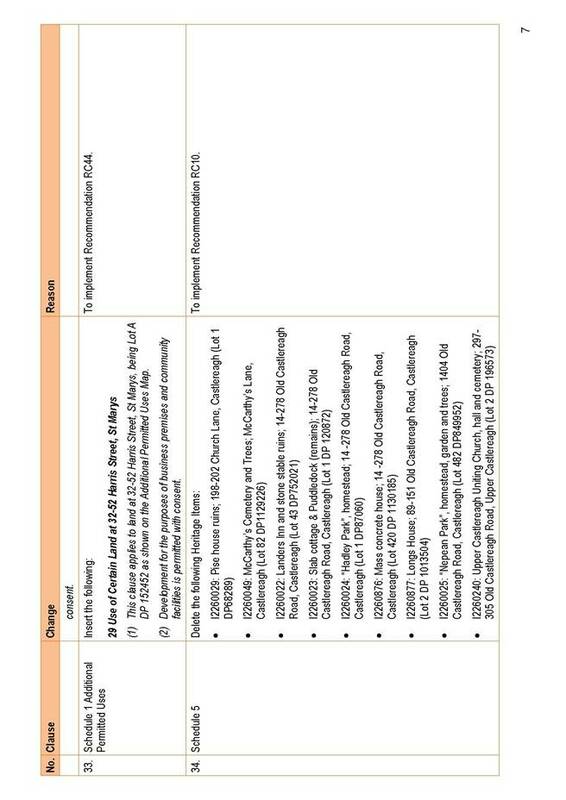 If the rezoning is not endorsed, Council?s housing targets will not be met.? Should the existing zoning remain, then further medium density housing can be developed in the form of strata titled townhouse type development.? Development of strata title townhouse developments would provide some additional housing but not of the density needed to meet the housing targets.? Once strata title development goes ahead it becomes very difficult to redevelop the land for higher density development in the future.? Maintaining the existing zoning would be a missed opportunity which compromises Council?s ability to meet targeted housing provision.? The community submissions on the Glossop Street zoning raise various issues that result from the direct impacts of future development.? Although these matters are an important consideration, they are all matters that are considered as part of the assessment of a development application.? 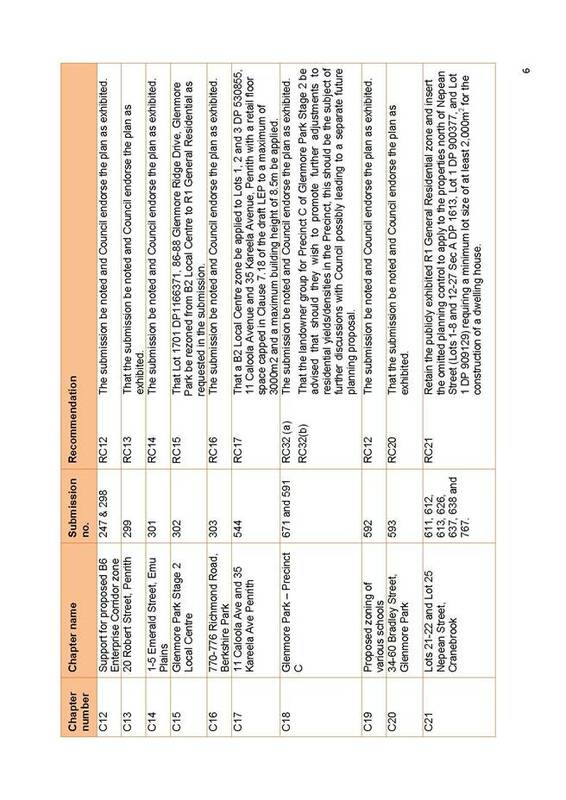 Currently the local community is notified of development proposals in accordance with the Development Control Plan.? However in future, under the new planning legislation, these developments are likely to become code assessable and there would not be an opportunity for neighbour notification.? Council involvement in the early planning stages for the new housing codes is crucial to ensure these impacts are being considered and relevant provisions are built into the new housing codes. Once the Stage 2 LEP is gazetted, further detailed precinct planning will be undertaken, building on the existing ?Glossop Street Precinct St Marys Urban Design Study? 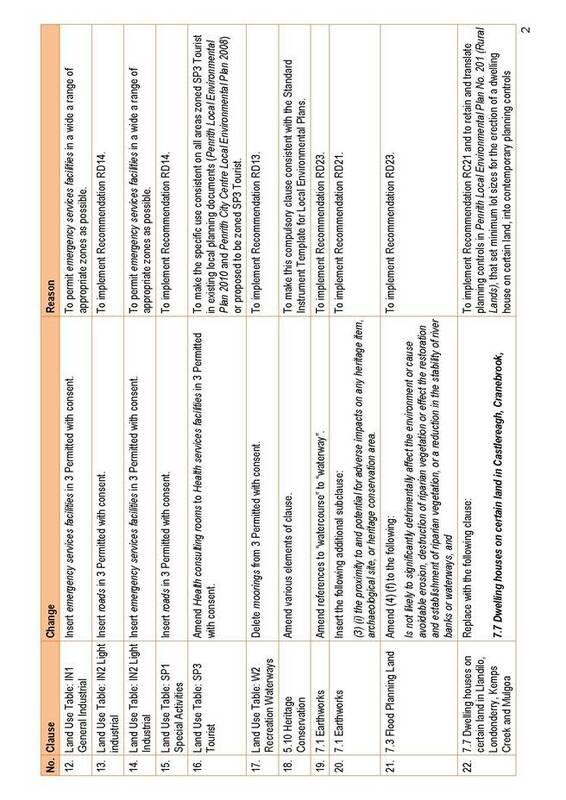 to guide future assessment of developments which can further address the specific concerns raised in submissions. ???? Views across to the Blue Mountains ? concerned about the loss of existing views due to higher density housing. 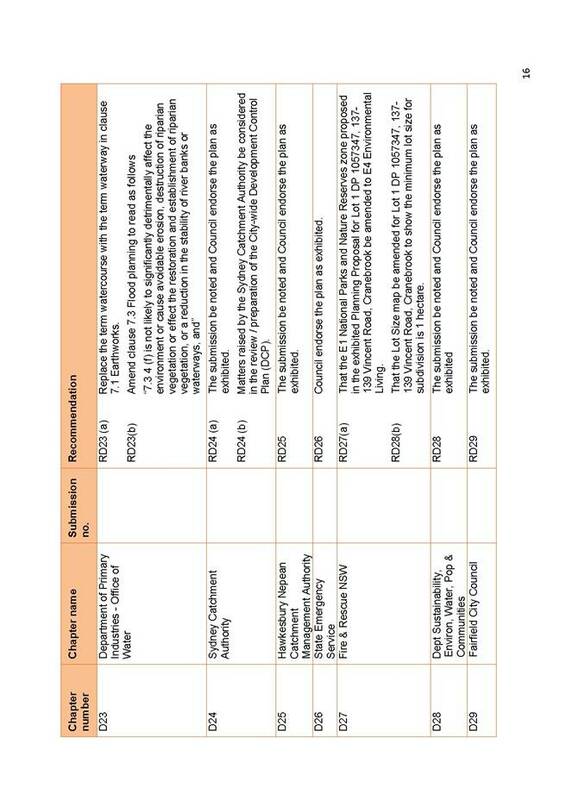 Council?s Property Development Department has made a submission as a commercial arm of Council. This submission was initially assessed by Council?s city planning team and then forwarded to the Blue Mountains City Council for an independent peer review to ensure that probity and transparency of the process is maintained. The relevant flood risk information will be available when the results of the Regional Flood Model incorporate the final landform for the Penrith Lakes Scheme. This can occur once the Department of Planning and Infrastructure has approved a final landform for the Scheme. 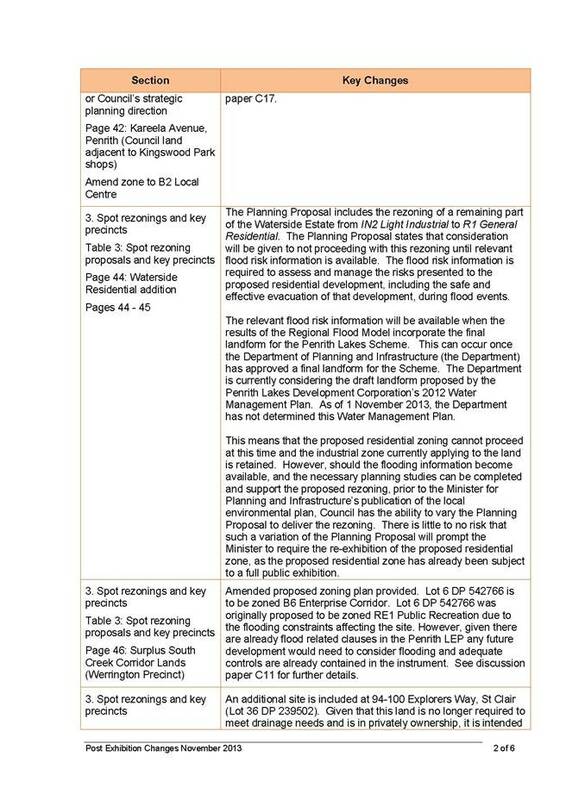 The Department is currently considering the draft landform proposed by the Penrith Lakes Development Corporation?s 2012 Water Management Plan. 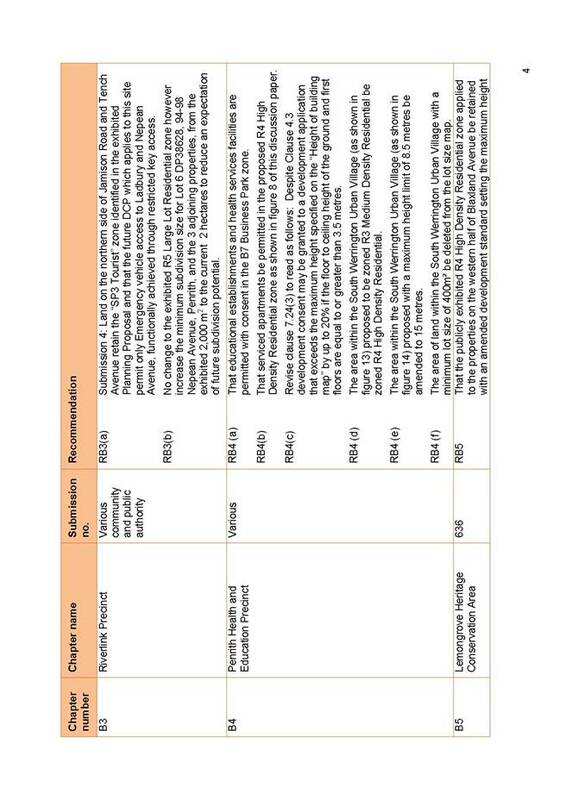 As of 1 November 2013, the Department has not determined this Water Management Plan. This means that the proposed residential zoning cannot proceed at this time and the industrial zone currently applying to the land is retained. However, should the flooding information become available, and the necessary planning studies can be completed and support the proposed rezoning, prior to the Minister for Planning and Infrastructure?s publication of the local environmental plan, Council has the ability to vary the Planning Proposal to deliver the rezoning. There is little to no risk that such a variation of the Planning Proposal will prompt the Minister to require the re-exhibition of the proposed residential zone, as the proposed residential zone has already been subject to a full public exhibition. It is therefore recommended that the proposed rezoning of part of 111-167 and 177-215 Andrews Road, Cranebrook (Lot 33 DP 270488) from IN2 Light Industrial to R1 General Residential not proceed at this time. 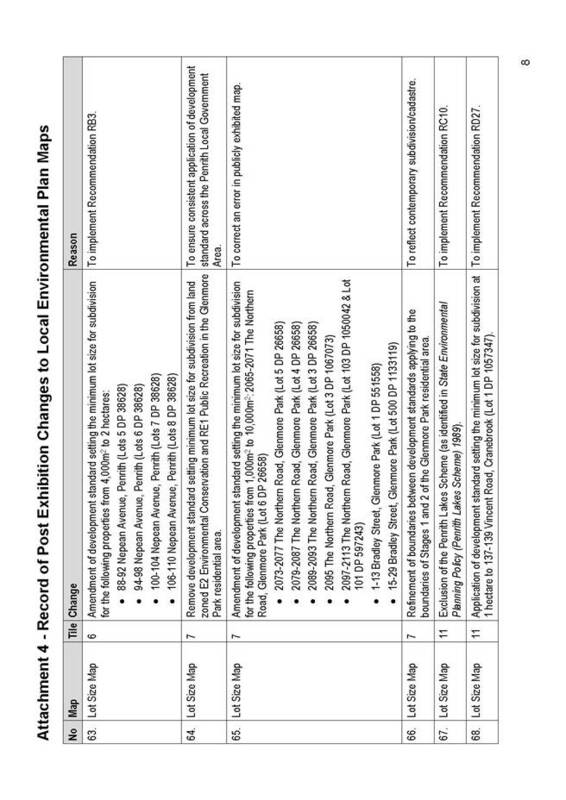 If the required flood risk information and planning studies are completed and are supportive of the proposed rezoning prior to the Minister for Planning and Infrastructure?s publication of the local environmental plan, a report will be presented to Council seeking its endorsement to deliver the proposed rezoning as part of the Planning Proposal. a.?? 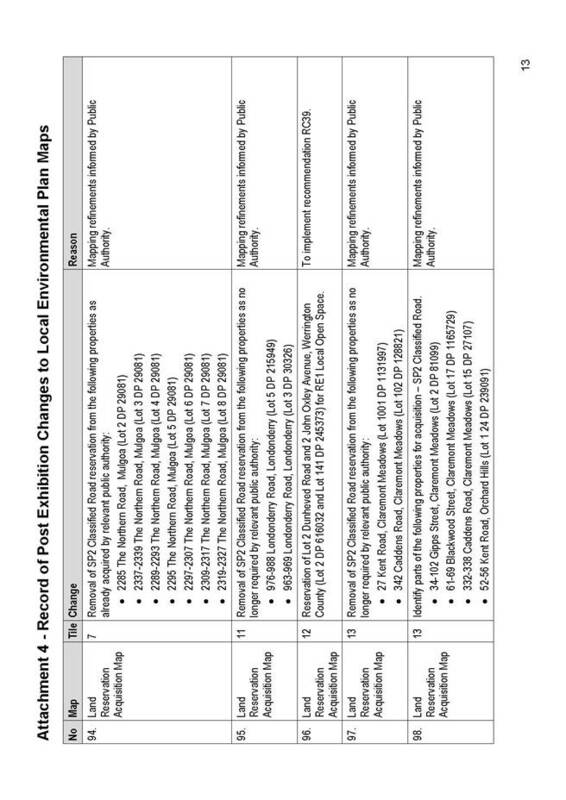 Attachment 2 - Table showing the record of Post Exhibition Changes to the Planning Proposal covering document for Penrith Local Environmental Plan as a result of the recommendations of the discussion paper and after consideration of other technical matters. b.?? 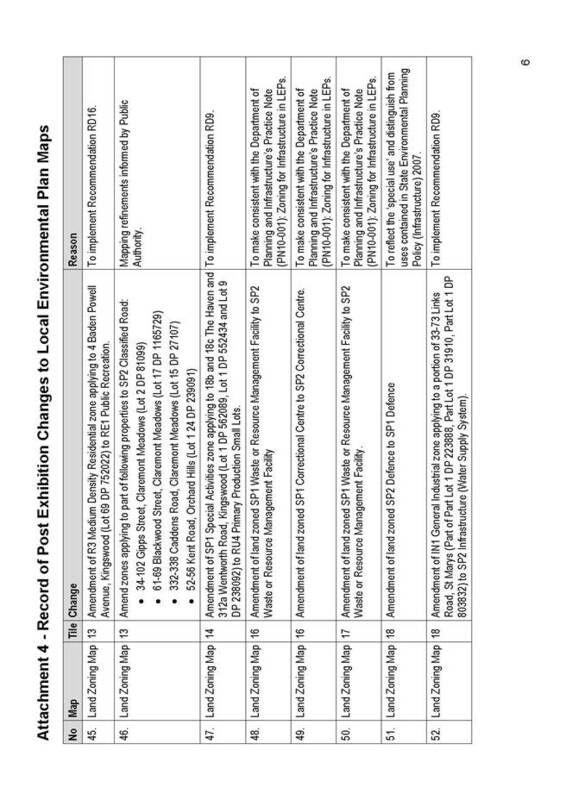 Attachment 3 - Table showing the record of Post Exhibition Changes to the draft Local Environmental Plan statutory instrument as a result of the recommendations of the discussion paper and after consideration of other technical matters. c.?? 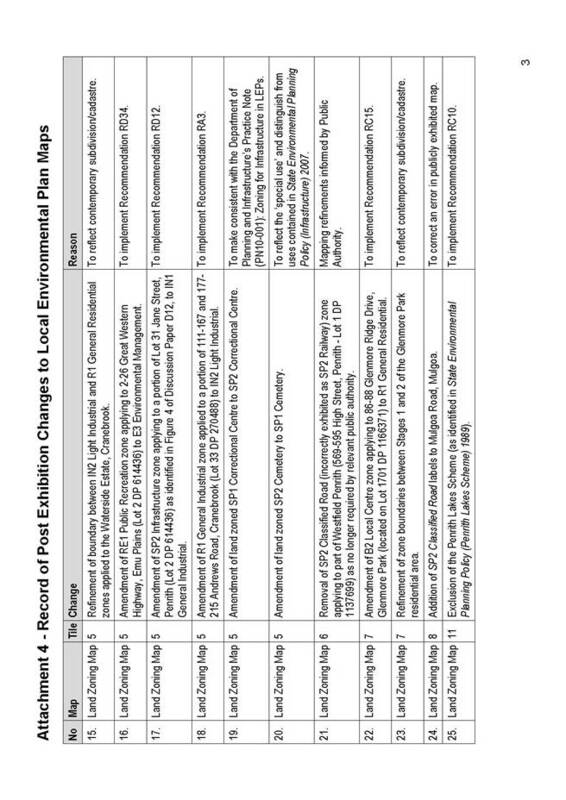 Attachment 4 - Table showing the record of Post Exhibition Changes to Local Environmental Plan Maps as a result of the recommendations of the discussion paper and after consideration of other technical matters. d.?? 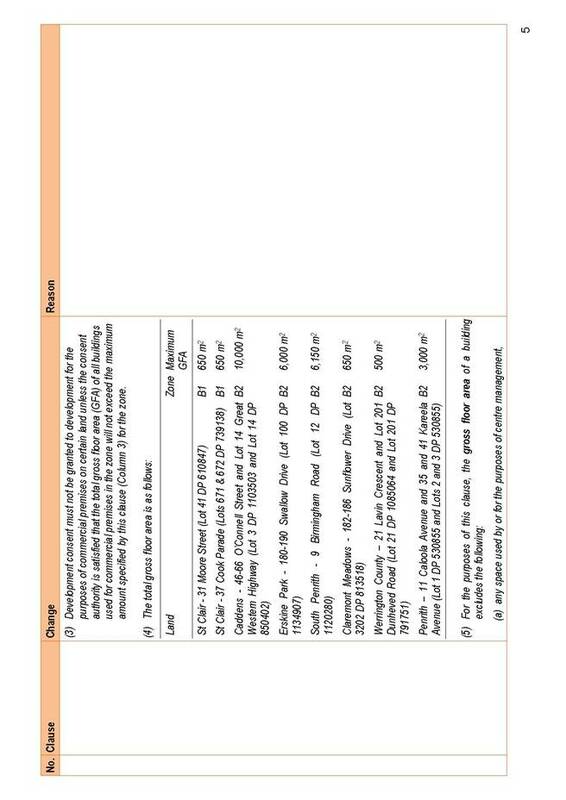 Attachment 6 - Table showing a summary of recommendations from the Discussion Paper. 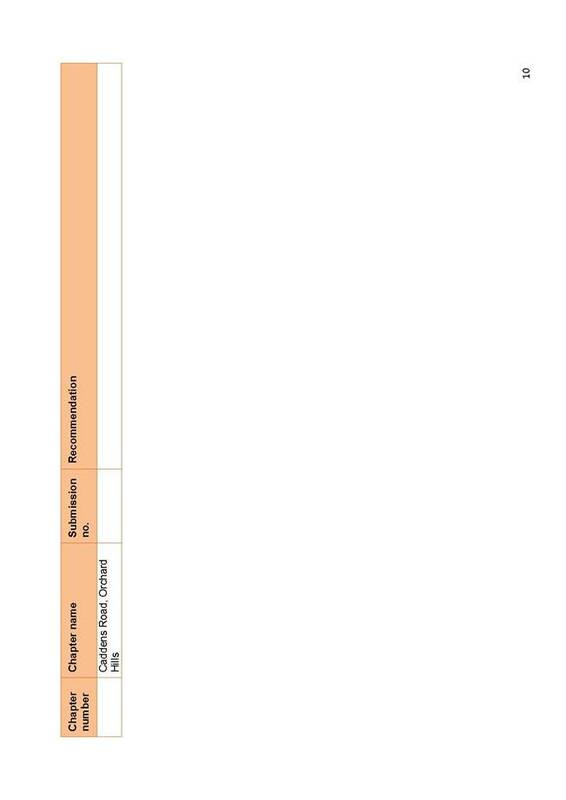 A fundamental consideration in any LEP (now Gateway) process is the nature and extent of any changes made to a Planning Proposal in response to, or following, public exhibition, and whether such changes are material to the operation and outcomes of the LEP.? Where potential changes are deemed to be material to the operation and outcomes of the LEP, it needs to be re-exhibited to ensure that communities are able to comment on the amended draft LEP / Planning Proposal. The new Gateway process has changed the way in which a decision about re-exhibition is made.? 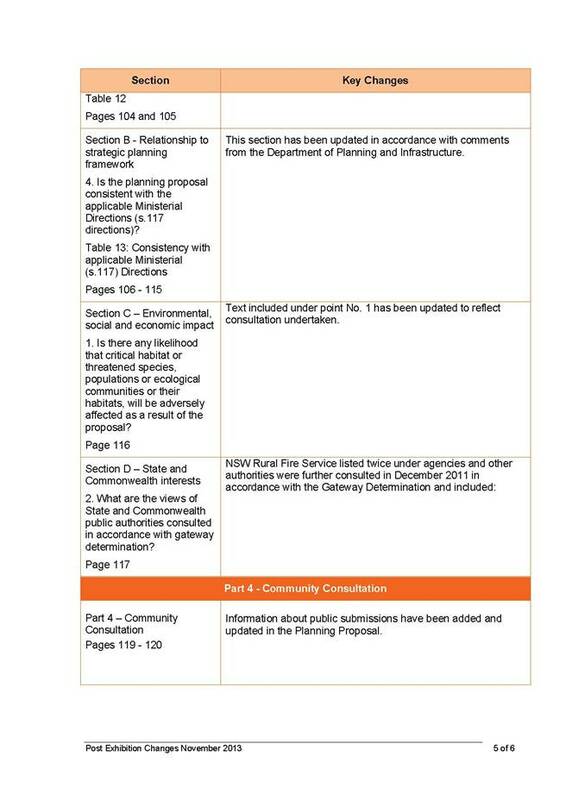 In accordance with s58(2) and (3) of the EP&A Act, further community consultation is now not required unless the Minister makes that direction in a revised (Gateway) determination.? However, following discussions with the Regional Office of the DP&I, Council should provide an initial view on any specific changes that it feels may warrant consideration for re-exhibition. One possible departure from this relates to 88-110 Nepean Avenue, Penrith (4 properties) as discussed in detail in Chapter B3 of Attachment 5.? During the exhibition of the Planning Proposal an error was noted on the Minimum Lot Size map.? The map indicated a minimum lot size of 2,000m2 although a 4,000m2 minimum lot size was recommended for this site and adjoining properties by the Rural Land Strategy and was exhibited accordingly in Stage 1 of the Penrith LEP.? The property owners were notified of the error and provided additional time to make a submission. However, it is unlikely that the development potential indicated in the Planning Proposal or as exhibited in Stage 1 of the Penrith LEP and advice provided to owners (4,000 m2) could be achieved given the flood constraints on these properties. It is therefore recommended that the current subdivision control requiring a minimum lot size of 2 hectares be retained. As the property owners were provided with the opportunity to make a further submission and there is no change to the current planning, it is considered that this change does not warrant a re-exhibition. However, this is a matter that may need to be considered by the Minister.? There are six other matters that may need the Minister?s consideration due to minor errors in the exhibited material. Again these were identified early in the exhibition process, owners were notified of the errors, additional time was made available for owners to make submissions and submissions were received which acknowledge the correct intended material/provision. 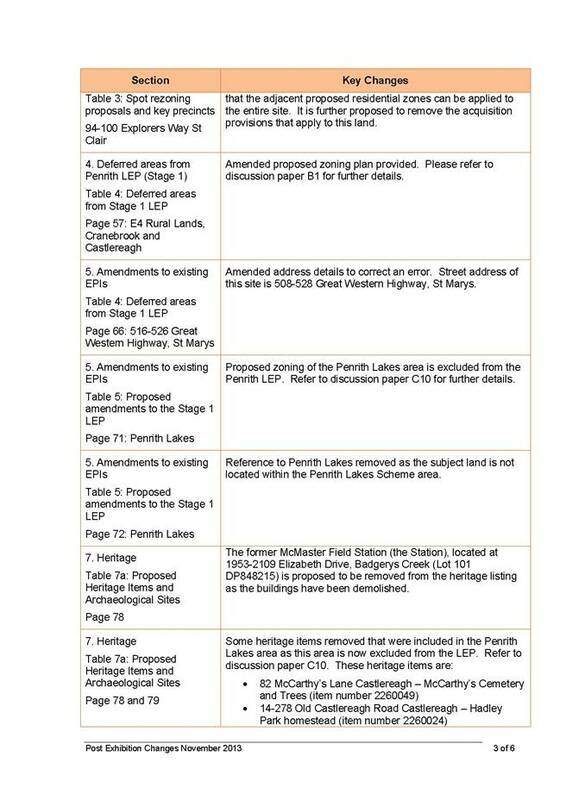 None of these six matters would alter the operation and outcome of the Planning Proposal for Penrith LEP, and therefore may not warrant re-exhibition. However these matters will be raised in our submission to the Department of Planning and Infrastructure. d.?? 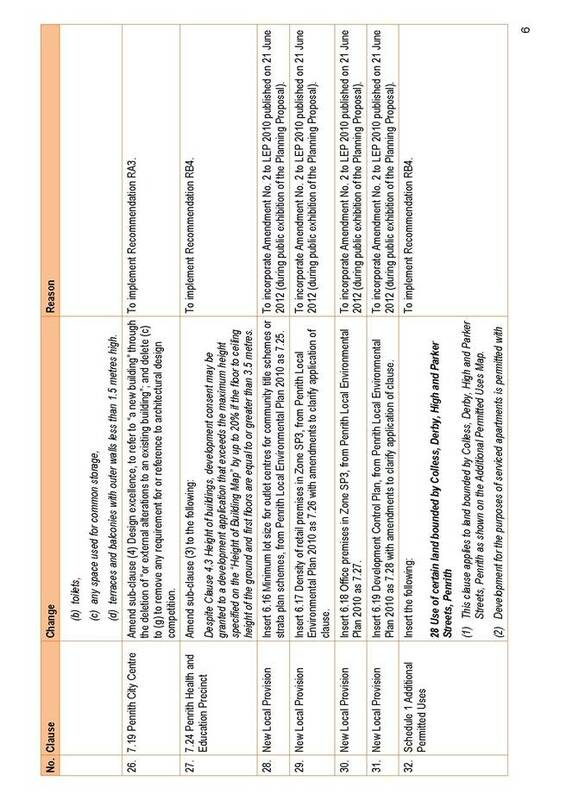 The recommendations of each chapter in Attachment 5.